Elizabeth, Princess of England was born 7 August 1282 in Rhuddlan Castle, Denbighshire, Wales, United Kingdom to Edward I of England (1239-1307) and Eleanor of Castile (1241-1290) and died 5 May 1316 in Quendon, Essex, England, United Kingdom of unspecified causes. She married Jan I van Holland (1284-1299) 8 January 1297 JL in Ipswich, England, United Kingdom. 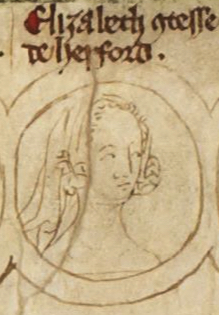 She married Humphrey de Bohun, 4th Earl of Hereford (1276-1321) 1 November 1302 JL . Notable ancestors include Henry II of England (1133-1189), William I of England (1027-1087), Charlemagne (747-814), Hugh Capet (c940-996), Alfred the Great (849-899). Ancestors are from the United Kingdom, Spain, France, Germany, Portugal, Russia, Ukraine, Belgium, the Netherlands, Italy, the Byzantine Empire, Sweden.